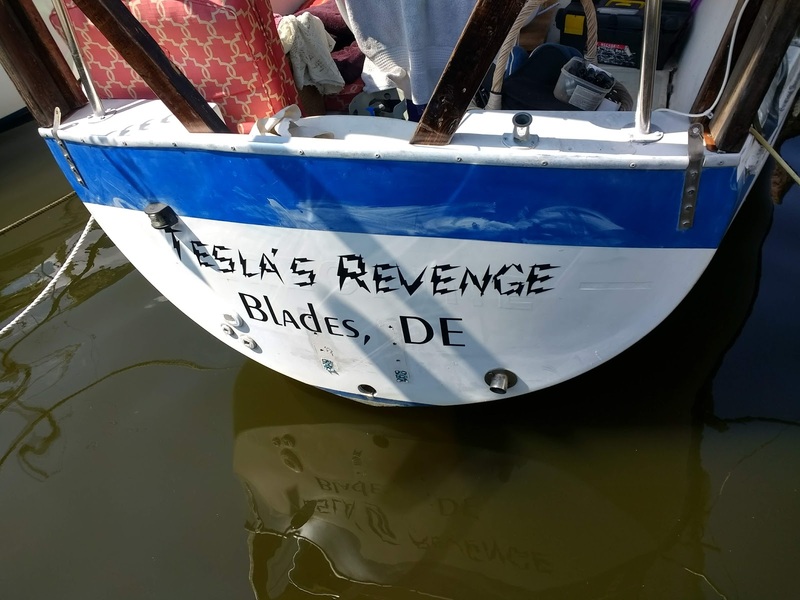 So on a rare (lately anyway) sunlit day and in our right minds and everything we loosed Tesla's Revenge from the docks and the marina used the bum boat to take her to the lift well. Thanks to Florence, we had LOTS of water in which to float. On pulling the boat out of the water, there was, indeed, quite a bit of growth on the prop and propshaft, which we promptly removed. Then we turned the prop by hand, and low and behold, it turned! But what was that weird noise? There was a bit of grinding--expected that with the cutlass bearing out of the water--but there was also this bizarre ping-ing noise, like a spring or something being plucked. So we got out the ladder and I climbed up into the boat and then down into the all-too-familiar depths of the motor space. Did I mention at any point that electric motors are torque-y as hell? I mean, most gas motors hit their torque peak around 1500 rpm, but an electric. . . . an electric hits it essentially at 0rpm. So when I crawled under I realized that the reason that the motor had seemed labored was that it was, indeed, turning the propshaft even with the zebra mussel and barnacle growth on it. It was also turning the stuffing box, the stuffing box bellows, and all the clamps: the whole damn assembly had been rotating. The "ping" sounds I had been hearing was from the loose ends of the hose clamps going round and round. It was a wonder we weren't taking on water apace. On further examination we realized that a former owner had shortened the drive shaft by several inches to facilitate mounting a different motor and transmission. That unfortunately left too little room to mount the pillow block the system really needs to be in alignment. 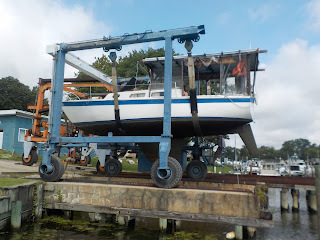 So we put the thing back together, and got back in the water. Aaaaaaand we're back to square one. So, after considering the costs of what we would need to do to make this work with the existing drive, we've decided to go back to plan A). To build the sternwheel we originally wanted to built. I currently have all the parts, bearings, and fittings, and will have the wood at the end of this week. FINALLY I get to see what kind of stern wheel you intend to make. If I like it I might do the same thing. We'll all be exploring it together. How big is the paddle wheel? The initial wheel to test out the system will be 3.6 feet with 2' buckets. To really be efficient, the wheel should be six feet, with three foot buckets. would a greater diameter be better? In theory, the larger the diameter the more nearly level the buckets move through the water and the more efficient, though, of course, moving a larger wheel means more power and more weight. I just sent a link to a picture of a conveyor belt with attacked 'paddles'. Float it between two pontoons aft?